Firstly I appreciate your knowledge and skills to explain topics in easy way. It has installed R2 as the best path to get to 4.4.4.4, so it doesn’t advertise the route through 192.168.13.3 to R2. Thank you for the lesson. I set up your topology and ran the configuration but the routers did not learn BGP route until i added the command “Network x.x.x.x Mask x.x.x.x” for each router for connecting network. Is it suppose to be so? Yes, that is the case. Notice in Rene’s initial configuration, the routers become BGP neighbors but there is only a single route being advertised between the four routers, that is the 4.4.4.4 network on R4. If you go into all the BGP tables of all the routers, only that route will be indicated. So unless you explicitly configure the network command, no routes will be advertised. This is a very good question. That’s why I labbed this one up and in the routers that I set up, it seems that R1, R2 and R3 all have two routes to the destination. I don’t see why R2 should only have one route. I’ll ask Rene to take a look at this one and if needed, the lesson can be modified appropriately. What symbol did you use ? I will let Rene know to revise the lesson appropriately. I did the exclude example in my lesson on a Cisco router where the exclude parameter looks for a string. The looking glass server you used requires a regular expression and in that case, you need to ignore the * with a slash like @lagapides explained. I tried to lab your given example, I would like to confirm with you why 4.4.4.4 is not reachable in R1? Even I tried to advertised 192.168.24.0/24 in R2 and 192.168.34.0/24 in R3. route-views.optus.net.au>show ip bgp regexp ? LINE  A regular-expression to match BGP AS paths. Use "ctrl-v ?" to enter "?" The example above applies regex to the entire output of the show command. You can get pretty creative with that. 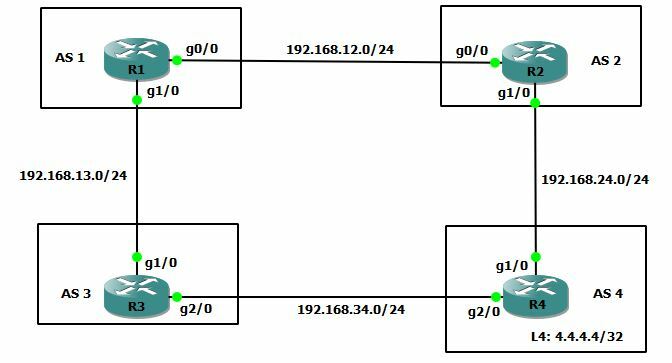 show ip bgp route-map ? Did you use my exact configs? If not, it’s best to paste the output of your BGP tables here.